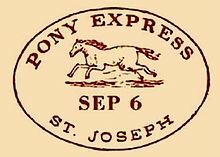 When one considers how iconic the Pony Express is in American history, it may be hard to believe that the service was in operation for only nineteen months, from April 3, 1860 until October 26, 1861. Perhaps its most famous rider was William Cody (1846–1917), who signed on at the age of 15, working first on the crews that built way-stations and eventually becoming a rider. Later, after the Civil War, Cody had a contract to supply buffalo meat to the Kansas Pacific Railroad, at which time he acquired the nickname Buffalo Bill. Cody’s later fame through his Wild West shows no doubt added to the celebrity of what came to be known as the Pony Express, better known by that name than by its official name, the Central Overland California and Pikes Peak Express Company. In 1860, “express” meant getting the mail from the Atlantic coast to the Pacific coast in ten days. There were approximately 186 Pony Express way-stations along the route placed about ten miles from one another. A horse would run from one station to the next, at which point the rider would switch to a different horse and carry on. A rider usually rode between 75 and 100 miles before giving his mail pouch over to another rider to continue the journey. Riders received a salary of $100 per month, about four times the wages of an unskilled laborer in those days. At the beginning, the cost of sending a half-ounce letter was $5.00, a week’s wages for an unskilled laborer, but eventually the price dropped to $1.00, a single day’s wages for an unskilled laborer. Although the Central Overland California and Pikes Peak Express Company could deliver mail faster than any other service, it did not win a contract with the United States Postal Service. The contract to deliver mail to California was instead given to a stage coach company called Butterfield Overland Mail, a company that stopped operation during the American Civil War (April 12, 1861 – May 13, 1865). The Pony Express itself went out of business two days after the transcontinental telegraph line reached Salt Lake City , Utah, thus completing a network of telegraph lines that made coast-to-coast transmission of messages possible. It is said that the telegraph made the Pony Express obsolete, even though the cost of sending a telegraph was a staggering $1.00 a word, the price of sending an entire letter by Pony Express. The difference, of course, was that that word sent by telegraph arrived almost immediately rather than taking ten days, so the telegraph was the communication of choice for people with an urgent need to get messages between California and the eastern United States. Eventually the way-stations of the Pony Express, which were purchased by Ben Holladay to serve as stops for his Butterfield Overland Mail stage coaches. Both the original Pony Express stations and the Butterfield coaches were purchased by Wells Fargo for $1,500,000. Wells Fargo operated stage coach services for less than a decade after that, as stage coach transporation dwindled sharply after the completion of the first transcontinental raiload in 1869. During its nineteen months of operation the Pony Express had acquired a certain amount of romantic glory and eventually became one of the legendary institutions of the American West, but it was not financially successful. During the time of operation, the Pony Express grossed only $90,000 and had lost around $200,000. The Pony Express delivered a total of about 35,000 letters during its nineteen months of operation. It has been estimated that an average of 269,000,000,000 emails were delivered worldwide every day in 2017. It has been claimed by some that people do not communicate as well as they used to do, but it certainly cannot be said that there is not more communication than there used to be.